This verse jumped out at me as I was reading last week. It's frustrating to be far away from a friend or family member in trouble. There's so much you wish you could do to help, but you can't. You can't bring a meal, watch the kids, drive to a doctor's appointment, or help look for what (or who) is missing. All you can really do is pray - and perhaps spread the word to those who CAN do more. Yet, "all you can do is pray" is A LOT--and something of a misnomer, isn't it? Prayer should be our FIRST line of defense - not something to fall back on when nothing else works - or there's nothing else we can do. Prayer can move mountains--it can shake the room you're in, and fill people with His Spirit. I have a dear online friend who is in the midst of a crisis. Her beautiful 21-year-old daughter is missing, and has been since May 9. I want to search for her - to join Lisa and her family, friends, and community in canvassing the neighborhood looking for Katalina. I want to stop by her house and clean the bathrooms, or wash the sheets and towels. I want to bring her and her family a meal, or fill her car with gas. But I can't. You see, there's 700+ miles between my house and Charlottesville, Virginia, where Katalina is suspected to be. So, I pray - and spread the word. And I trust God to use my prayer to shake some rooms--and perhaps memories--and take care of every need Katalina and her dear family have. Because that's what God does. Thanks for reading. Be sure to link up with your own thoughts, and read the other contributors here. I'm sure you'll be blessed! Praying and trusting and waiting on the Lord. Thanks for putting words to the frustration I'm feeling about "just praying." And thank you for the reminder that it isn't "just" praying after all :) Another example of God's word pointing the way in the midst of our meanderings. 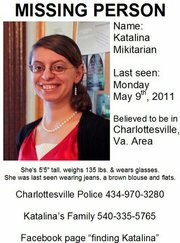 PRAYING boldly and with faith for Katalina to be found. So glad I get to add to the "Woot" at the end of this where you updated. God is SO SO Good! Immediately said a prayer as I read and was delighted to see at the bottom that she had been found. Prayer works! Wow, Joanne--every time I look, I find something new that someone did in the prayer effort that I had no idea about. And I'm blessed all over again. Thank you. I am so excited to find your blog. I began blogging in December and this is exactly what I have been looking for in the blogging community. I cannot wait to keep reading and learning from all of you. As it is Tuesday, I am late so will put a previous post on prayer. Praise God she is ok!I know..I always say well I can pray,when in fact,that IS the best and first thing I should be doing. Thank you for that reminder!